Now let's be wildly anachronistic. Imagine Dr. Freud in his forties, working on The Psychopathology of Everyday Life and "going to the Internet to do some research," as the TV / movie cliché has it. He sits at his laptop typing queries into Google: "bed-wetting OR enuresis site:edu", "+bosnia +herzegovina +turks", and so on. Meanwhile, pattern-matching agents are targeting him for advertisements: "Find out what causes bed-wetting", "Drug free in home bedwetting treatment program with counseling", "Searching for bed wetting alarms? ", "Find a huge choice of medical cosmetic items that meet your needs! ", "Cheap Sarajevo Flights", "Help Kosovo Orphans", and so on. John Battelle coined the phrase the database of intentions to highlight the sheer amount of information that search histories contain about people's interests and desires. In some cases, these keywords can be revealing enough that they can be tied to specific individuals, as in the well-publicized case of AOL searcher 4417749. As the Freud example suggests, however, people search for a variety of reasons. A friend of mine once bought me a CD for a present, and then was irritated because Amazon kept recommending other music that he didn't like based on that purchase. Amazon has since introduced a gift-wrapping option that, I suspect, serves a double purpose ... knowing which items are gifts helps their recommendation engine avoid such gaffes. The whole point about visualization, of course, is that it should enable us to see things we might otherwise have missed. 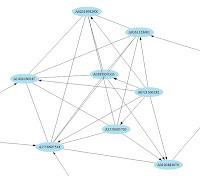 When we look at the network of recommendations that connects books on the reading list, we notice a number of interesting patterns. Monads and dyads. There are a number of books that aren't related by recommendation to any of the others on the list. The one shown in the figure here is Sconce's Haunted Media. Recommended items in the Amazon catalog include other books about haunting and more general books about popular media. There are also a number of pairs where one or both of the books recommends the other. The examples shown here are Clark's Natural Born Cyborgs -> Clark's Being There, Staley's Computers, Visualization, and History -> Cohen and Rosenzweig's Digital History, and Garfinkel's Database Nation <-> O'Harrow's No Place to Hide. A classic cluster. This tightly knit cluster consists of four books that have attained 'classic' status in new media and digital humanities: Laurel's Computers as Theater (1991), Aarseth's Cybertext (translated 1997), Murray's Hamlet on the Holodeck (1998), and Manovich's Language of New Media (2002). The fact that none of these well-known works is a recommended accompaniment to anything on the list that was published more recently suggests that it might be worth searching more generally for temporal strata in networks of recommendations. 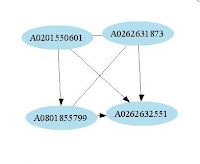 The bridge and the subcluster. 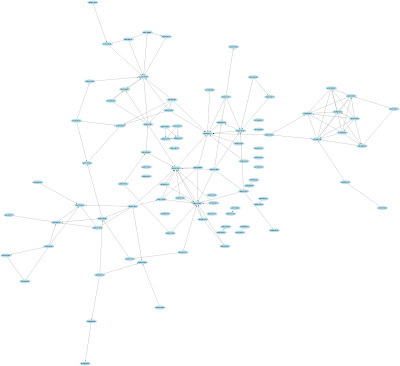 One of the more interesting things about this network is that there is a single book linking the main body of the network with a fairly large and tightly knit subcluster. The bridging book is Langville and Meyer's introduction to search engine ranking Google's PageRank and Beyond. The books at the center of the subcluster include Baeza-Yates and Ribeiro-Neto's Modern Information Retrieval, Manning and Schütze's Foundations of Statistical NLP, Grossman and Frieder's Information Retrieval, Weiss et al's Text Mining, Belew's Finding Out About, Witten, Moffat and Bell's Managing Gigabytes, Chakrabarti's Mining the Web, and Witten and Frank's Data Mining. These books form the technical core of the reading list. The fact that they're outside the network of recommendations for more general readings on digital humanities highlights the divide that I'm trying to bridge with this blog. One of the objectives of a comprehensive / general exam is to learn how to do things with a stack of books: to trace the origins of ideas or concepts, find pairings or clusters that would work well together in a syllabus, find key works that are emblematic of a particular school, and so on. Digital approaches like the one demonstrated here can be very useful in this process. A couple of weeks ago, I posted a reading list for a graduate exam in digital history. These kinds of lists are customarily around 80-100 books, so I didn't have room to include everything that's in my digital history library, or even everything that seemed essential (the list is quite light on programming books, for example.) Some of my students and colleagues were kind enough to send me suggested additions, which I may include in a subsequent post. It's been quite a while since I posted a hack, so I decided to do something with the reading list. Suppose you're interested in digital history and you want to know what other books I might've included on the list, or what similar books someone else might have recommended. Is there any way to automate the process of searching for similar books? Sure. The first step is to get a complete set of recommendations via the Amazon API. We pass my blog post through a simple scraper to get the ASINs (Amazon Standard ID Numbers) for each book on the list. In a loop, we then submit each ASIN to Amazon and get back an XML file that includes ASINs for recommended books. We create a big list of (ASIN, ASIN) pairs. Each one of these is a recommendation: customers who bought the first book also bought the second one. Since we will want to play with these data later on, we use a high-level Python module called pickle to save them to disk. Python source code for the first step is here. Now that we've got a big list of recommendations, the second step is to concentrate on the books that come up most frequently. We unpickle our data then create a list of recommended books and filter out any that appear on the original list. We count the number of times each is recommended and sort to create a frequency list with most frequently recommended books at the top of the list. Python source for the second step is here. So how well did it do? All of the books that were recommended four or more times appear in the list below. I have most of them and think any could easily have been included on the original list. I was recently tagged by Michael Lorenzen, a librarian who blogs at The Information Literacy Land of Confusion to play the game "5 Things." The basic idea is that you are supposed to list five things about yourself that people probably don't know and then tag five other bloggers to keep it going. I could just play along, but what would be the fun of that? I've decided to hack the rules a little bit so I can use this as an opportunity to say something about digital history. So, what might a future digital historian learn when he or she looks back at this activity? 1. Memes. In the mid-1980s when I'd had enough of being a microbiology major [#1] and decided to switch into cognitive science, I bought and read Richard Dawkins's book The Selfish Gene. Most of his argument is devoted to the idea that the gene is really the unit of selection. It doesn't matter if the species, or community, or group, or even the individual prospers, as long as the gene gets a chance to replicate itself. In his final chapter, however, Dawkins took on cultural transmission, arguing that a new kind of replicator that he called a meme had emerged in "the soup of human culture." "Examples of memes are tunes, ideas, catch-phrases, clothes fashions, ways of making pots or of building arches. Just as genes propagate themselves in the gene pool by leaping from body to body via sperms or eggs, so memes propagate themselves in the meme pool by leaping from brain to brain via a process which, in the broad sense, can be called imitation." His idea took off. You might say that the meme meme was very successful at replicating itself. Our future historian might be able to use archived internet records to see how the people who played games like this one understood what they were doing. I notice, for example, that Google Blog Search returns 86272 hits for "5 things." Almost twenty percent of those posts also use the word "tagged" (16532) and about six percent use the word "meme" (5433). Some other co-occurring words that might be useful include "chain" (1040), "viral" (165), "contagious" (82), "epidemic" (54), "wildfire" (37), "contagion" (4) and "diffusion" (2). 2. Models. It's one thing to say that memes spread by imitation, it's another to formalize that. I used to work in a clinical trials and epidemiological data centre [#2] where people quantified things like incidence (the percentage of the population affected in a given period), susceptibility (the degree to which a given host is vulnerable), infectivity (the capacity of a microorganism to cause infection), and virulence (the severity of disease). Different diseases are transmitted differently, either directly, or indirectly via live vectors or inanimate vehicles. Some epidemiological models may be useful to our future historian; many won't be. But having a complete, time-stamped record of the course of the "outbreak" will make it possible to create models that are far more precise and accurate than the ones that we can currently formulate. 3. So-called vanity searches. If I hadn't set up automatic searches for my last name, "digital history," "history and computing," and a number of other topics [#3] I wouldn't know that I had been tagged for this game. I hadn't come across Michael's blog before this. Vanity searching (i.e., Googling yourself) isn't just a way of finding out, as Stephen Colbert puts it, "Who's honoring me now?" It's a useful way to monitor how you appear to other people on the web. More importantly, it's a good way to find fellow travellers. As new digital historians create blogs, put up websites, and socially tag things that they find interesting, they link to existing sites. I regularly discover new researchers and new projects by following these links when they show up on my feedreader. Our future historian will no doubt make extensive use of perpetual analytics in their research, but will they be able to trace my searching behaviour? Almost certainly. 4. Blogospheric continents. Most "5 things" posts seem to include at least six links: one to the person who tagged you, and one each to the five people that you are tagging in turn. So each time somebody plays the game, the blogosphere gets denser, more closely knit, by six links. In a classic paper (Graph Structure in the Web) Andrei Broder and his colleagues showed that in 1999 the web had a macroscopic structure, consisting of a strongly connected core, a collection of nodes linking in toward the core, a collection of nodes that could be reached from the core by outward links, and pages that could not reach the core or be reached from it. I don't know if anyone has done a comparable study of the blogosphere yet. Probably they have. With a rich enough archive, it should be possible in the future not only to reconstruct the continents of the blogosphere, but to see them changing over time. Future historians might use something like plate tectonics to visualize these changes. (I talk a little bit about plate tectonics in my forthcoming monograph [#4], which isn't about digital history). 5. Micro-scale social networks. I found it hard to figure out who to tag next [#5]. Should you limit your choices to people who you already know ... online at least, if not in person? Should you only tag blogs that seem about as popular as your own? Should you tag new bloggers, in an effort to bring them into the social flow? Well-established ones, in an effort to get them to notice you? Records of the "5 things" game will be incredibly informative about the social mores of blogging, especially if they are correlated with geographic information, previous patterns of citation, Technorati rank, and so on. Suzanne, "History Museums and the Semantic Web," Public Historian. Brett Holman, "The Scareship Age," Airminded. Alan MacEachern, "Take Your Student to Work Day," Alan MacEachern. Gavin Robinson, "Digital History Projects: Planning," Investigations of a Dog. Alun Salt, "The Antikythera Mechanism," Archaeoastronomy. In an earlier post I put together a list of undergraduate courses that would provide useful background for a student interested in pursuing digital history. For graduate students, a more useful exercise is to compile a reading list of a hundred or so books for a general / comprehensive examination. Obviously, there are very few books that are specifically about digital history (never mind a canon) so any list has to cover the space where the field is emerging. It's tricky. Below is the list that I would give a student if one came to me tomorrow. I'd expect them to negotiate the list with me, tailoring it to their level of technical expertise, getting rid of a few things and adding a few. I haven't read some of the books, but I've read enough of them that I could easily finish the rest as we were working through the list. There are a few books that I'd love to assign, but they're long out of print (like Ted Nelson's Computer Lib / Dream Machines). I'd be very interested in hearing from students or professors who are currently doing a field like this or want to. Other suggestions are welcome, of course. Aarseth, Espen J. Cybertext: Perspectives on Ergodic Literature. Baltimore: Johns Hopkins, 1997. Abbate, Janet. Inventing the Internet, new ed. Cambridge, MA: MIT, 2000. Agre, Philip E. Computation and Human Experience. Cambridge: Cambridge, 2005. Baeza-Yates, Ricardo and Berthier Ribeiro-Neto. Modern Information Retrieval. Addison-Wesley, 1999. Barabási, Albert László. Linked: How Everything is Connected to Everything Else and What It Means. Plume, 2003. Bateson, Gregory. Steps to an Ecology of Mind, new ed. Chicago: Chicago, 2000. Battelle, John. The Search: How Google and Its Rivals Rewrote the Rules of Business and Transformed Our Culture. Portfolio, 2005. Belew, Richard K. Finding Out About: A Cognitive Perspective on Search Engine Technology and the WWW. Cambridge: Cambridge, 2000. Beniger, James. The Control Revolution: Technological and Economic Origins of the Information Society. Cambridge, MA: Harvard, 1989. Benkler, Yochai. The Wealth of Networks: How Social Production Transforms Markets and Freedom. New Haven: Yale, 2006. Berners-Lee, Tim. Weaving the Web: The Original Design and Ultimate Destiny of the World Wide Web. Collins, 2000. Bowker, Geoffrey C. Memory Practices in the Sciences. Cambridge, MA: MIT, 2006. Bowker, Geoffrey C. and Susan Leigh Star. Sorting Things Out: Classification and Its Consequences, new ed. Cambridge, MA: MIT, 2000. Brown, John Seely and Paul Duguid. The Social Life of Information. Boston: Harvard Business School, 2002. Briggs, Asa and Peter Burke. A Social History of the Media: From Gutenberg to the Internet, 2nd ed. Polity, 2005. Burnard, Lou, Katherine O'Brien O'Keeffe and John Unsworth, eds. Electronic Textual Editing. MLA, 2006. Campbell-Kelly, Martin. From Airline Reservations to Sonic the Hedgehog: A History of the Software Industry, new ed. Cambridge, MA: MIT, 2004. Castells, Manuel. The Internet Galaxy: Reflections on the Internet, Business, and Society. Oxford: Oxford, 2003. Ceruzzi, Paul. A History of Modern Computing, 2nd ed. Cambridge, MA: MIT, 2003. Chakrabarti, Soumen. 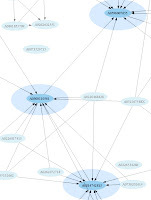 Mining the Web: Analysis of Hypertext and Semi Structured Data. San Francisco: Morgan Kaufmann, 2003. Clark, Andy. Being There: Putting Brain, Body, and World Together Again. Cambridge, MA: MIT, 1998. Clark, Andy. Natural-Born Cyborgs: Minds, Technologies, and the Future of Human Intelligence. Oxford: Oxford, 2003. Cohen, Dan and Roy Rosenzweig. Digital History: A Guide to Gathering, Preserving and Presenting the Past on the Web. Philadelphia: Pennsylvania, 2005. Dornfest, Rael, Paul Bausch and Tara Calishain. Google Hacks, 3rd ed. Sebastopol, CA: O'Reilly, 2006. Edwards, Paul N. The Closed World: Computers and the Politics of Discourse in Cold War America. Cambridge, MA: MIT, 1997. Erle, Schuyler, Rich Gibson and Jo Walsh. Mapping Hacks. Sebastopol, CA: O'Reilly, 2005. Galloway, Alexander R. Protocol: How Control Exists after Decentralization. Cambridge, MA: MIT, 2004. Galloway, Alexander R. Gaming: Essays on Algorithmic Culture. Minnesota, 2006. Garfinkel, Simson. Database Nation: The Death of Privacy in the 21st Century. Sebastopol, CA: O’Reilly, 2001. Garside, Roger, Geoffrey N. Leech and Tony McEnery, eds. Corpus Annotation: Linguistic Information from Computer Text Corpora. Addison Wesley Longman, 1997. Gitelman, Lisa. Scripts, Grooves, and Writing Machines: Representing Technology in the Edison Era. Stanford: Stanford, 2000. Gitelman, Lisa. Always Already New: Media, History, and the Data of Culture. Cambridge, MA: MIT, 2006. Gitelman, Lisa and Geoffrey B. Pingree, eds. New Media, 1790-1915. Cambridge, MA: MIT, 2004. Goldsmith, Jack and Tim Wu. Who Controls the Internet? Illusions of a Borderless World. Oxford: Oxford, 2006. Grossman, David A. and Ophir Frieder. Information Retrieval: Algorithms and Heuristics, 2nd ed. Dordrecht: Springer, 2004. Hafner, Katie and Matthew Lyon. Where Wizards Stay Up Late: The Origins of the Internet. Simon and Schuster, 1998. Headrick, Daniel R. When Information Came of Age: Technologies of Knowledge in the Age of Reason and Revolution, 1700-1850, new ed. Oxford: Oxford, 2002. Hemenway, Kevin and Tara Calishain. Spidering Hacks. Sebastopol, CA: O'Reilly, 2003. Hockey, Susan. Electronic Texts in the Humanities. Oxford: Oxford, 2004. Hughes, Thomas P. Human-Built World: How to Think about Technology and Culture. Chicago: Chicago, 2005. Ingold, Tim. Perception of the Environment: Essays on Livelihood, Dwelling and Skill. London: Routledge, 2000. Jenkins, Henry. Convergence Culture: Where Old and New Media Collide. New York: NYU, 2006. Kaptelinin, Victor and Bonnie A. Nardi. Acting with Technology: Activity Theory and Interaction Design. Cambridge, MA: MIT, 2006. Kidder, Tracy. The Soul of a New Machine. Back Bay, 2000. Knowles, Anne Kelly, ed. Past Time, Past Place: GIS for History. Redlands, CA: ESRI, 2002. Langville, Amy N. and Carl D. Meyer. Google's PageRank and Beyond: The Science of Search Engine Rankings. Princeton: Princeton, 2006. Lanham, Richard A. The Economics of Attention: Style and Substance in the Age of Information. Chicago: Chicago, 2006. Latour, Bruno. Science in Action: How to Follow Scientists and Engineers through Society. Cambridge, MA: Harvard, 1988. Latour, Bruno. Reassembling the Social: An Introduction to Actor-Network-Theory. Oxford: Oxford, 2005. Laurel, Brenda. Computers as Theatre. Addison-Wesley, 1993. Lesk, Michael. Understanding Digital Libraries, 2nd ed. San Francisco: Morgan Kaufmann, 2004. Lessig, Lawrence. Free Culture: The Nature and Future of Creativity. New York: Penguin, 2005. Levy, David M. Scrolling Forward: Making Sense of Documents in the Digital Age. New York: Arcade, 2003. Lévy, Pierre. Collective Intelligence: Mankind's Emerging World in Cyberspace. Perseus, 2000. Levy, Steven. Hackers: Heroes of the Computer Revolution. New York: Penguin, 2001. Livingstone, David N. Putting Science in Its Place: Geographies of Scientific Knowledge. Chicago: Chicago, 2003. Lutz, Mark. Programming Python, 3rd ed. Sebastopol, CA: O'Reilly, 2006. Lutz, Mark and David Ascher. Learning Python, 2nd ed. Sebastopol, CA: O'Reilly, 2003. Manning, Christopher D. and Hinrich Schütze. Foundations of Statistical Natural Language Processing. Cambridge, MA: MIT, 1999. Manovich, Lev. The Language of New Media. Cambridge, MA: MIT, 2002. McCullough, Malcolm. Digital Ground: Architecture, Pervasive Computing, and Environmental Knowing. Cambridge, MA: MIT, 2004. Mindell, David A. Between Human and Machine: Feedback, Control, and Computing before Cybernetics, new ed. Baltimore: Johns Hopkins, 2004. Mitchell, Tom M. Machine Learning. McGraw-Hill, 1997. Mitchell, William J. Me++: The Cyborg Self and the Networked City. Cambridge, MA: MIT, 2003. Monmonier, Mark. Spying with Maps: Surveillance Technologies and the Future of Privacy. Chicago: Chicago, 2004. Moody, Glyn. Rebel Code: Linux and the Open Source Revolution. Perseus, 2002. Murray, Janet H. Hamlet on the Holodeck: The Future of Narrative in Cyberspace. Cambridge, MA: MIT, 1998. Nardi, Bonnie A. and Vicki L. O'Day. Information Ecologies: Using Technology with Heart. Cambridge, MA: MIT, 2000. Nunberg, Geoffrey, ed. The Future of the Book. Berkeley: California, 1996. O’Harrow, Robert. No Place to Hide. Free Press, 2006. Raymond, Eric S. The Cathedral and the Bazaar: Musings on Linux and Open Source by an Accidental Revolutionary, rev. ed. Sebastopol, CA: O'Reilly, 2001. Rosenfeld, Louis and Peter Morville. Information Architecture for the World Wide Web, 3rd ed. Sebastopol, CA: O'Reilly, 2006. Schreibman, Susan, Ray Siemens and John Unsworth, eds. A Companion to Digital Humanities. Blackwell, 2004. Schuurman, Nadine. GIS: A Short Introduction. Malden, MA: Blackwell, 2003. Sconce, Jeffrey. Haunted Media: Electronic Presence from Telegraphy to Television. Durham, NC: Duke, 2000. Shapin, Steven. The Scientific Revolution. Chicago: Chicago, 1998. Singh, Simon. The Code Book: The Science of Secrecy from Ancient Egypt to Quantum Cryptography. New York: Anchor, 1999. Staley, David J. Computers, Visualization and History: How New Technology Will Transform Our Understanding of the Past. M. E. Sharpe, 2002. Suchman, Lucy A. Human-Machine Reconfigurations: Plans and Situated Actions, 2nd ed. Cambridge: Cambridge, 2006. Tufte, Edward R. Envisioning Information. Graphics Press, 1990. Turner, Fred. From Counterculture to Cyberculture: Stewart Brand, the Whole Earth Network, and the Rise of Digital Utopianism. Chicago: Chicago, 2006. Weber, Steven. The Success of Open Source, new ed. Cambridge, MA: Harvard, 2005. Weiss, Sholom, Nitin Indurkhya, Tong Zhang and Fred Damerau. 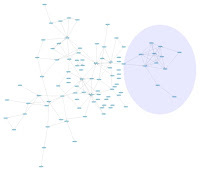 Text Mining: Predictive Methods for Analyzing Unstructured Information. Springer, 2005. Wiener, Norbert. The Human Use of Human Beings: Cybernetics and Society. Da Capo, 1988. Willinsky, John. The Access Principle: The Case for Open Access to Research and Scholarship. Cambridge, MA: MIT, 2005. Winograd, Terry and Fernando Flores. Understanding Computers and Cognition: A New Foundation for Design. Addison-Wesley, 1987. Witten, Ian H. and Eibe Frank. Data Mining: Practical Machine Learning Tools and Techniques, 2nd ed. San Francisco: Morgan Kaufmann, 2005. Witten, Ian H., Alistair Moffat and Timothy C. Bell. Managing Gigabytes: Compressing and Indexing Documents and Images, 2nd ed. San Francisco: Morgan Kaufmann, 1999. Yates, JoAnne. Control through Communication: The Rise of System in American Management. Baltimore: Johns Hopkins, 1993. In Gaming, Alexander Galloway argues that a theory of action for computer games requires at least two dimensions. Acts are either diegetic (set within the narrative of the game) or nondiegetic, and can be due either to the operator or the machine. Diegetic operator acts are probably what most people think of when they think of video games: grinding on a skateboard, shredding, stealing a car, rolling everything in the universe into a giant ball, or what have you. The operator acts in a nondiegetic way when he or she starts, pauses, saves or stops the game. The machine acts in a nondiegetic way by keeping score or declaring "game over" when the operator proves to be too stupid to live (diegetically). Galloway's discussion of the fourth quadrant of this scheme, diegetic machine acts, is particularly interesting in its implications for digital history because it portrays worlds with change but without history. Here is his description of Yu Suzuki's game Shenmue. One important role for computer games in education is as things to think with. Many researchers have focused on the kinds of lessons that gamers are implicitly or explicitly learning from the diegesis of particular games. Kurt Squire's work on historical simulation games like Civilization and Age of Empires is an excellent example. As the ambience act of Shenmue shows, however, computer games can also serve as a laboratory for exploring ideas of change and history in nondiegetic ways. Setting aside the historical relevance of the Shenmue storyline, the game is still interesting because it clearly distinguishes between two kinds of events: those that can have consequences and those that cannot. When the operator is involved, choices and actions can make a difference later on, the score changes and it is possible for the game to end. In contrast, the ambience act is purely ahistorical. If characters aged while the game was idling, or could become sick or die, the game wouldn't really be idling. Allowing students to experience the contrast between game play and the ambience act might be one useful springboard for discussion of the myth of people without history in a historiographical or methodological seminar.